As this article is released, the guys are playing in Scotland and Spain with plans to hit Germany and the Netherlands later this year. 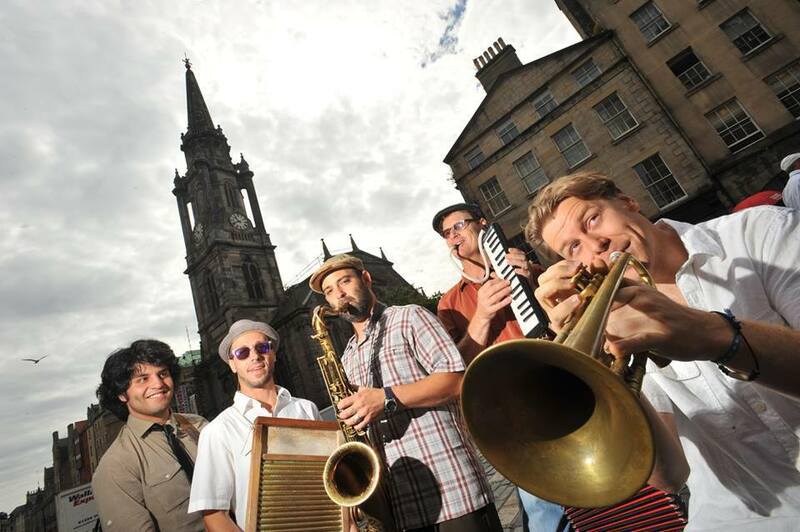 If that wasn’t enough, the Honeydrops are scheduled to play Hornings Hideout this summer, The Chenango Music Festival, Strawberry Music Festival, The Monterey Jazz Festival, The Russian River Music Festival and The Mulberry Mountain Music Festival. Throw in some scattered, one-night gigs all over the country and that makes for a very busy year. The Honeydrops recently played The High Sierra Music Festival on July 4th weekend and judging from the packed tent at the fairgrounds, their set was one of the best performances of the weekend. If you have any doubt, watch the YouTube link that shows the crazy crowd dancing their feet off and screaming tirelessly for more. It was one of those moments that will be remembered for a long time. At the center of it all, singing and playing guitar is Lech Wierzynski. Originally from Warsaw Poland, Lech speaks with a southern drawl, but has an intellectual, urban, city-vibe to his dialect. Lech began playing blues and jazz as a teenager at after-hours jam sessions in Washington D.C. After studying trumpet with Marcus Belgrave (Ray Charles), Lech continued his career after moving to Oakland, honing his craft with some of the biggest names in American music, such as Maria Muldaur, Dan Hicks, and Jackie Payne. Whether busking on the sidewalk or playing some of the big name clubs in the Bay area, Lech is a professional and talented musician. He’s passionate about the musical process and is able to navigate the difficult, intimidating music industry with patience and respect. 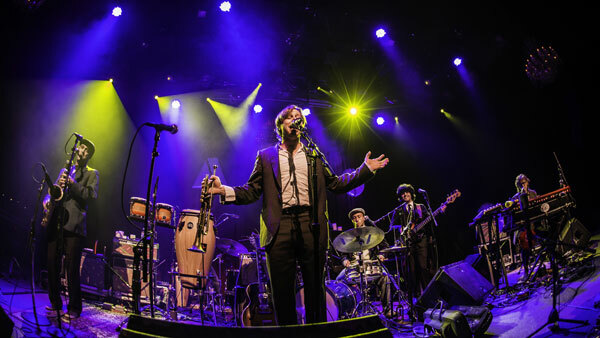 Playing scaled-down drum-kit (bass drum, snare and symbols) and singing back-up vocals is Ben Malament who has played with Terry Reid, The Marvelettes and The Jelly Roll Souls. Ben’s style is simple, but aggressive. You can hear jazz rudiments, crushes and precise meter in his playing. In acoustic situations, Ben will bust-out the Washboard. On Sax is none other than Johnny Bones (Eddie Palmiere, Nell Carter, Steve Lucky and the Rhumba Bums), who is an integral part of this band. He’s well known in the scene and has a powerful and clean sound. Currently touring with the Honeydrops is Lorenzo Loera on bass who has to be living the dream by touring with this band. The young bass player is keeping up and holding down the back-line nicely. Also playing with the band right now is Charles Hickox on keys who’s been around for a long time in the San Francisco Bay area music scene. 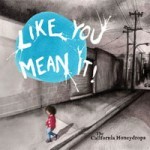 The Honeydrops just released their latest CD on Tubtones Records entitled Like You Mean It. The 13-track compilation has Soul, Jug-Band, and Rhythm & Blues throughout the production with uplifting, graceful and passionate songs from beginning to end. The sound of the album spans generations and there’s no doubt that your parents will love it, your friends will go crazy over it and your children will shake their little booties to it. Otis Redding, Sam Cooke and James Brown would all be proud of this soulful masterpiece. Tracks such as Other Shore, Got The Feeling and Like This Like That all resonated amazingly with me. There's even a musical "interlude" entitled Prayer on the ablum just in case you need a break and want to clear your mind with soothing sounds for 57 seconds. 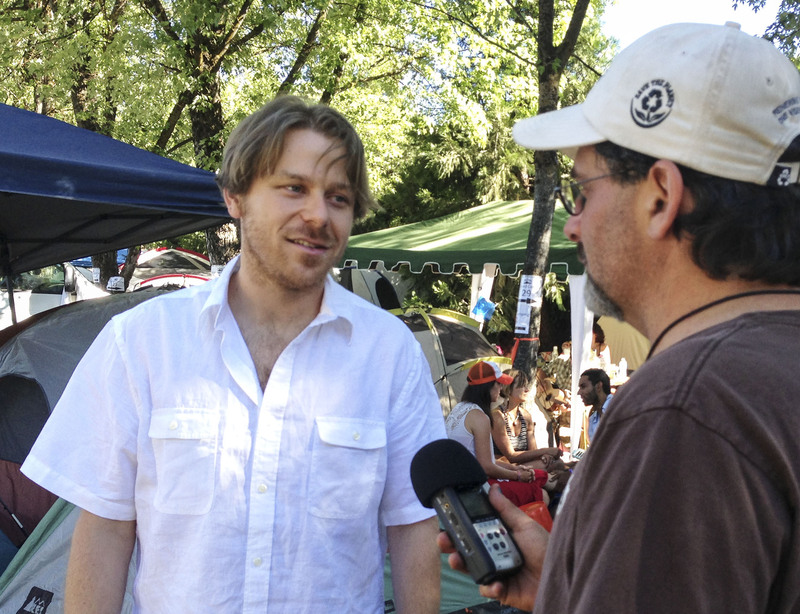 For our interview, Lech and I spoke at his campground at The High Sierra Music Festival as people strolled by our area, temperatures swelled to 90 degrees and music from the Grandstand Stage could be heard in the distance. Behind us were other members of the band, playing and rehearsing on acoustic instruments. Also seated on the grass were Dan “Lebo” Lebowitz (ALO), with various friends and fans all sharing in the magical moment. JBF: Please take me back to the beginning because I’m not familiar with the Honeydrops’ story. Lech: Oh, you mean the humble beginnings? Well, we started as a busking group for fun on the street, as a jug-band trio with washboard, tub-bass and guitar. That was the most original set up and something we just did for fun. Some of us had been busking for years and really making a living doing it. As I became more of a professional musician playing trumpet in bands, I wanted to do something fun, and I always liked playing on the street. Me and my buddies were like, “hey, let’s go out when we have some time-off and go out to the Bart station and make some change on the street like we used to do”. That was done strictly for fun. We recorded a home-made demo with a piano player that I knew from doing Rhythm & Blues and Soul gigs. We brought him in and recorded this thing, got a gig at a pizza place which funded one of our albums through a fundraiser. That place was called the Cheeseboard Collective in Berkeley. That got us launched to another level and we kept growing since then. Many people have changed – we went from Tub-Bass to acoustic bass to electric & acoustic to mostly electric these days. The sound has evolved into a very original thing that I don’t hear any other bands doing right now. It’s a mix of all the music we love, but I don’t think there is a genre you could put on it. Back in the day we used to take a song, in the style of a James Brown ballad. Then we would do Memphis Soul and also ‘80s funk. We would even do a ‘20s rag-time, jug-band number. You see what I’m saying? And now, you can hear all that in one song mismatched in so many ways with the ability to make people dance. Back in the day we used to get, “Oh you guys that was fun, but what kind of music is that?” We’re very proud that it’s not any of these things, but our own original creation. It’s been a long time coming getting here. The amount of research in a way has been huge, trying to figure out a way to put this all together in a way that still feels good to us. 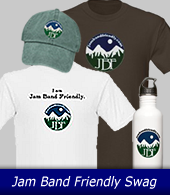 JBF: We are in July now, what have the last 6 or 7 months been like for the band? Has it been a whirlwind? Lech: Things are definitely moving forward quickly. We just released a CD and also signed on with a booking agency, which is something we have stayed away from like the plague for a long time. We finally did that last September, which hasn’t been too long. We officially brought in our manager full-time on salary with the rest of the band members. And the CD Like You Mean It is something we are proud of. We got a ton of gigs coming up all around the world – we are going to Spain, Scotland, and up to the Northwest to play the String Cheese Festival. We are here at High Sierra Music Festival which we weren’t at last year. We’ll play Strawberry Music Festival, head to Germany and Netherlands in the fall. We’ll be all over the US in October, so it’s like things are really moving fast. JBF: Sounds like it. 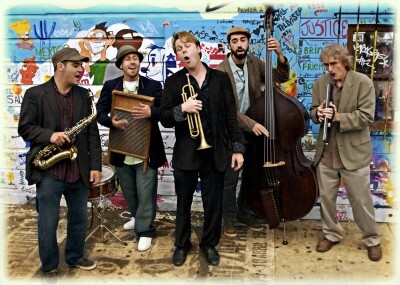 The California Honeydrops are well known in Central California. It has to feel good that you have made a name for yourselves. Lech: I think it is especially hard when you don’t have a genre to fit in. We do fit into this festival world, but for a long time I don’t think we were embraced by it. Now, as things are developing, we are definitely feeling welcome and yes it does feel good. It has been a tough road for us to say the least. We have our fans to thank for it. They funded tours and the new album. We reached out to the people who have seen us and didn’t care what to call it. That’s what has helped us, people remembering the name and who we are. JBF: It seems like things are definitely working out for you, but what are some challenges or gripes you have faced? Lech: The music business is a scary and slightly evil place. It doesn’t always make sense, like as you get bigger so do the rooms, but the sound gets worse and worse. The experience for you as a musician sometimes goes downhill as you have more fans. And the experience for the fans, we have had a lot of fans for a long time and they complain that there’s no room to partner-dance anymore. The clubs want you to sell out the room, but we and the fans don’t want to sell out the room. They want to have a little bit of space and be comfortable. Mixing money with art is always problematic. You just have to find a way to get thru it as best you can. Not just going for every piece of gold you can get and making sure you are still delivering a quality experience to your people. Making sure you are still being fed by it creatively, that’s the true essence. Do I have gripes? I’m not going to name any names but everyone knows there are some shady people out there. The thing is, work with as many people as you can that are good. That way you can preserve a good vibe, because if you get infected with something that’s not right with a possible opportunity, things can go sour. That’s why we’ve taken so long before signing up with a booking agent and band manager. We wanted to make sure we had positive momentum going towards a good place before bargaining with an agency. It’s seems like we’ve got a fast push upwards, but it’s also a time to be careful. We are in it for the long-haul anyway. JBF: I detect some kind of drawl, accent or twang in your voice. Lech: I am from Warsaw, Poland and grew up in Chicago and Washington DC. High School was terrible because I came from an urban environment into a more suburban environment as I was hitting adolescence. I couldn’t really adjust, but luckily my folks moved out of the DC area. Although, that place was great for me in terms of music. I had a great teacher in school who inspired me to always keep things simple. Once I was old enough to drive and go into DC from the Burbs, I found all these great musicians that taught me a lot of what has still stuck with me. I had a great experience in college too. It was in the Bay area that I learned about Soul and Rhythm & Blues. Coming of age as a musician and singer was really right before this band, mostly with people 40 years older than me. These are people who had hits back in the ‘60s, they know how to work the crowd. Oakland has a long history in the bay with Blues – Jackie Payne, Freddie Hughes, Karl Green and Maria Muldaur too. They are the ones that brought me to becoming a front man. JBF: What about after the New Year, are you guys thinking that far ahead? Lech: Man, we never know what is going to happen next. We just hope to be playing more nationally and internationally. Really, the most important thing now is to keep the band creative. Because right now there’s so much push for the business stuff that we have to keep that creativity alive. These types of festivals are great for that aspect. You get to meet and jam with new people to get new ideas. The business will take care of itself and we’ll keep focusing on the band. JBF: Good to hear! Have a great year Lech. Thanks for your time and we’ll see you Sunday in the Vaudville Tent.